Part 5 of the Anti-social Behaviour Act 2003 added airguns that use a self-contained air cartridge system to Section 5 of the Firearms Act, alongside real handguns, thus made practically totally illegal. Only around 1500 were surrendered and 6000 put on a firearm license. BASC estimates that around 68000 are still in circulation, the owners of which will face prosecution should they be found in possession or decide to hand them in to the police. Essentially, somewhere near 70000 new criminals were created overnight. Another 'feel-good' law that achieved nothing but the destruction of people's hobbies and property. This was a tabloid paper fueled, short term solution for politicians to pander to growing public disgust at an increasing number of drug-gang related shootings in city areas. The use of these airguns in crime was blown way out of proportion and simply provided a convenient scapegoat. The majority of ‘converted’ replica guns of Brocock type seized and used in crime consisted of merely the zinc frame, all other major componants having been replaced and engineered from steel to hold the pressures involved in firing a real cartridge. 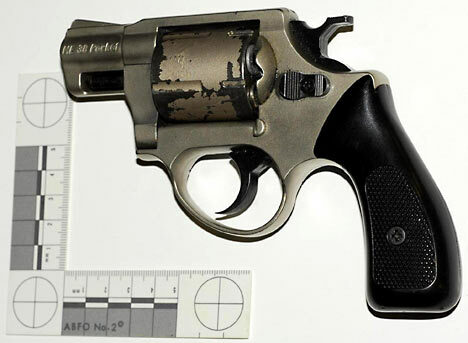 In the case of the largest bust on an illegal gun factory, entirely new cylinders for these improvised weapons were machined from steel using a lathe set up and a new steel 9mm barrel was manufactured. No doubt this operation would have produced firearms despite this particular replica gun’s legal availability. Another ‘feel-good’ law that only effected the law abiding and simply provided a means for politicians to look ‘tough on gun crime’ . I wish they would repeal this stupid law. You can sign this petition at the link here. Spread to as many forums and email lists as possible. i think the law on TAC airguns is pathetic- we owners got shafted, because, unlike owners of live ammo guns, we weren’t even compensated if we handed the guns in! i have 2 of these guns- one’s worth £200, & the other £150. i got mine licenced, as there was no way i was gonna hand in weapons of that value for nothing! just wish the government would sort out the Brocock ban…it was unfair at the time…and is not fair now……just signed the petition….the will not repeal it…but we can live in hope…..
CO2 air rifles used to be FAC but now aren’t. I’d think that this far along time has proved that the air cartridge “conversions” haven’t caused the mass shoot-em-ups that were envisaged. By all means leave them on FAC – but for ##### sake remove the ban on selling them. These ill thought out, knee jerk reactionist laws which seek to take away our liberty and freedom are ALWAYS a one way street. There is no prospect of repeal to bring back TAC guns or cartridge pistols. The only way we can once again take control of our own destinies is a complete overhaul of our political, banking and commerce sytems. This will only happen once a full blown revolution gets underway. The uprising began a couple of years ago but Middle England didn’t join in and we missed our chance. The reason we have our freedoms taken away is simply apathy. Its time for us to take back control. The point about Brocock revolvers being altered was that the alterations were done in a machine shop and only utilised the frame of the gun. Since not everyone has a nachine shop in their garden shed, it follows that the number of such alterations was miniscule and the police, as usual, fabricated a few stats to achieve their ends. – together with a remanufactured 9mm barrel. Oh, and the ammo is, of course, available over the counter at any Tesco store. The manner in which this entire ban was conducted was disgraceful, as was the attitude of the press which fueled the ban – but it sold copy so that\’s OK. There are still around 50,000 Brocock guns floating around out there owned by law abiding people loathe to lose considerable sums of money in the face of the refusal of the government of the day to pay compensation. So that worked, didn\’t it ? I saw all this coming and got out of the UK and moved to Canada. I own high powered rifles and shotguns here, but air cartridge guns need a licence too. I don’t know what new gun laws are coming out of the Trudeau Government soon, but he will have a heck of a fight on his hands by the 3 million or so hunters and target shooters here if he tries to lean on us. I’m considering an option for residency in the USA, as the left leaning western nations seem determined to disarm everyone.